Welcome home to this highly desired 55 Plus community of the Villas at Shady Brook! This exceptional expanded Willow model boasts immaculate, move-in condition, volume and 9-foot ceilings, and neutral upgraded decor throughout. No need to sacrifice living space and beautiful water views whilst enjoying a wonderful resort-like lifestyle. Convenient location is near restaurants, shopping, medical facilities, towns and easy access to major cities. Enjoy an open floor plan from the foyer leading to living/dining rooms, both with hardwood floors and cathedral ceiling, and a 27' kitchen. The living room offers a gas fireplace with Mt. Vernon mantel, flanked by shutters windows topped with quarter-moon windows, and eyeball lighting. The dining room offers a handsome chandelier. The eat-in kitchen with large sun-drenched breakfast room (8 shuttered windows!) boasts abundant granite counter space and upgraded bisque cabinetry, under-cabinet lighting, tiled backsplash, tiled floor, pantry, under-mount sink with gooseneck faucet, and recessed lighting. Whirlpool Appliances include a refrigerator with bottom freezer, gas range, built-in microwave, dishwasher, plus disposal. Move through the kitchen to a full-sized laundry room with utility sink, closet, and access to the 2-car garage, also with large storage closet. 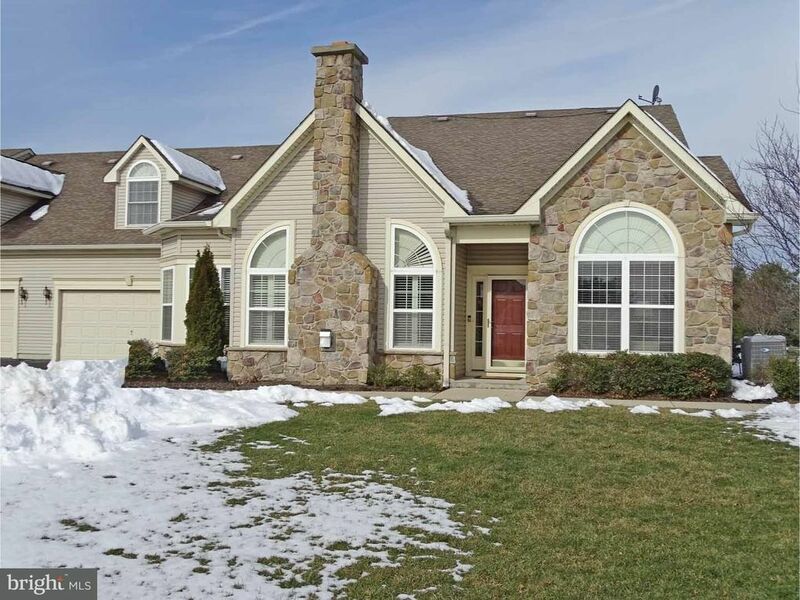 A roomy den with neutral carpet features sliding glass doors leading to a 10' x 20' paver patio with retractable awning overlooking open space, pond, and fabulous view of Shady Brook Farm, especially at holiday time! A spacious en-suite main bedroom with tray ceiling and fan boasts a tiled full bath with double comfort-height bisque vanity, soaking tub, shower, and linen closet. Completing the first level is a 2nd bedroom (currently used as an office), tiled hall bath with pedestal sink, linen and coat closets. Upstairs discover a 3rd over-sized bedroom with full bath, full wall of clothes closets, utility closet, and access to partially floored attic for loads of storage. Clubhouse amenities include indoor and outdoor pools, tennis, gym, game rooms, and a myriad of activities. Association fees include CAM, lawn care, trash and snow removal, and roof replacement. Also worth mentioning: new state-of-the-art Carrier HVAC with efficient humidifier; upgraded thermostat; newer water heater with electronic ignition; alarm system with central-station monitoring and off-site controls; and custom shutters. Will I see you at the closing table?